What is kataifi you ask? (pronounced Ka-ta-EE-fi) Sometimes called “kadaif” or “qadaifi" it seems to have at least two definitions. 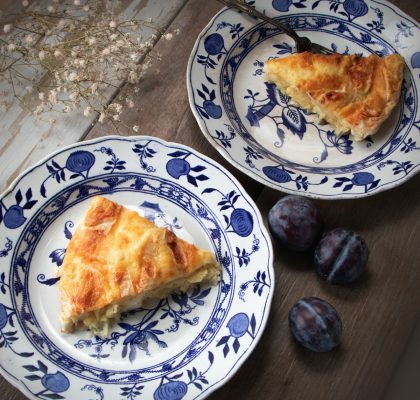 The first one is that it is a name for a type of dessert made with chopped almonds, sugar and cinnamon with a sweet aromatic syrup poured over it. 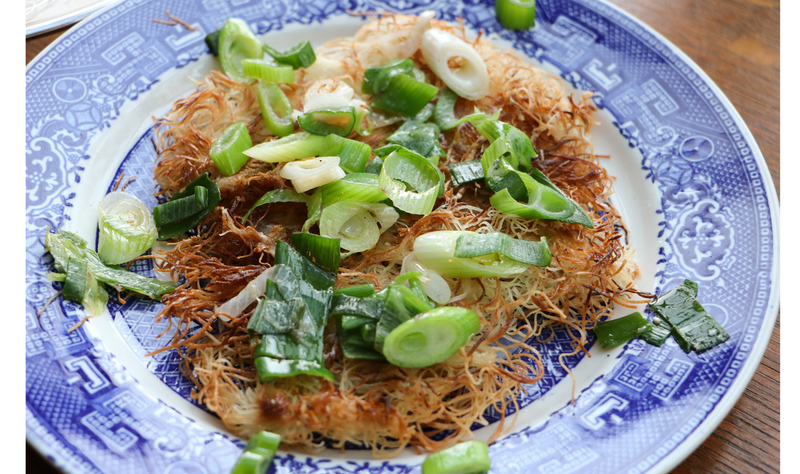 The second, is that kataifi is a form of fillo dough. Made as a very thin, watery dough it is pushed through a fine sieve onto a rolling hotplate cooking it just enough to retain it's shape without hardening it. The thready filaments of pastry dough are traditionally used in Mediterranean cuisine for both savory and dessert dishes. 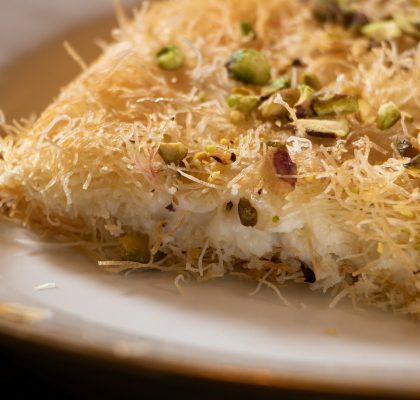 However, western chefs have discovered the neutral flavor of kataifi and use it to wrap shrimp, bake it with savory dishes, pie toppings, make nests for mousse, baked in cones and stuffed with cannoli cream. The list goes on and on. 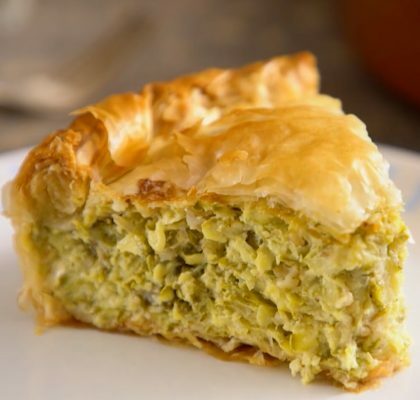 When it bakes up it is crispy and neutral in flavor, taking on or enhancing the flavors of the dish it is prepared with. Endlessly versatile. Your imagination is your only limit. 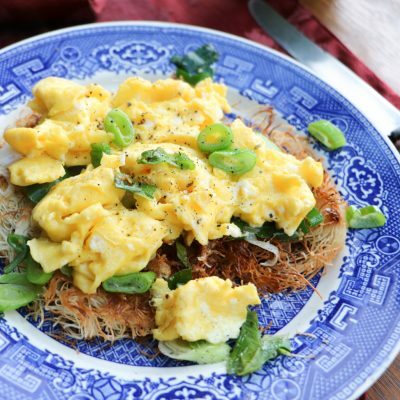 Dress up a simple breakfast for one, or throw a brunch party using this easy, innovative recipe using kataifi as a bed for your eggs, replacing calorie laden hash browns with a healthier option. The recipe is for one serving, but is easily doubled, tripled etc - so easy for quick entertainment or your own pleasure. 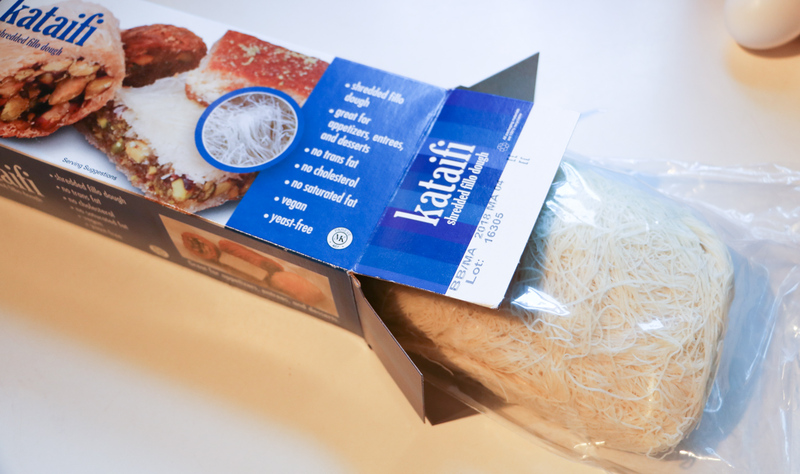 Open the box of kataifi and pull or cut off aprox 1 cups worth. Shape it into a nest about the size of your palm. Fry this in butter or olive oil on each side until browned, seasoning with a little salt and pepper. Set aside, or keep warm in a toaster oven on low. In a teaspoon of olive oil, saute the scallions on medium high heat until just softened. 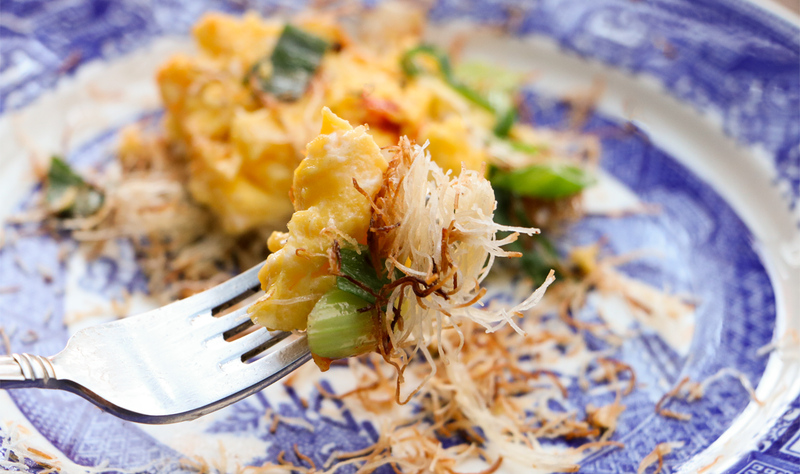 Lower heat to low, mix up the eggs with a fork until frothy and pour over the scallions, scrambling, stirring until the eggs are just set and done. 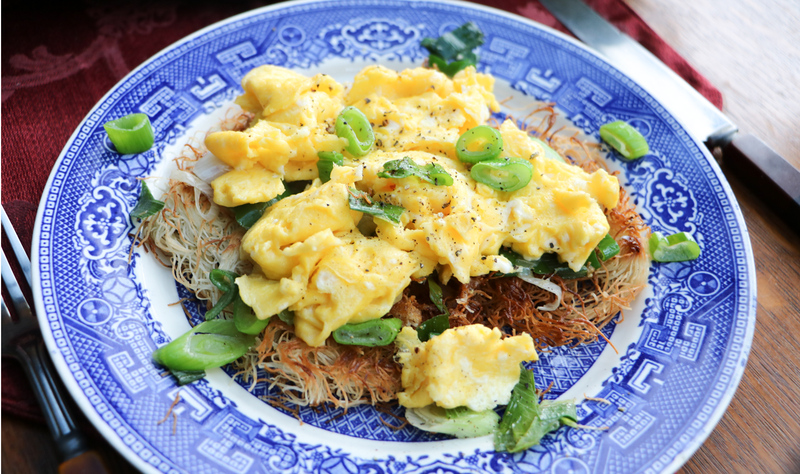 Place the kataifi nest on a plate, place the eggs over the top and dot with hot sauce. This recipe can be doubled or tripled as you need to. Add a side salad and it is easy to make a quick brunch this way that is unique and fun to serve.